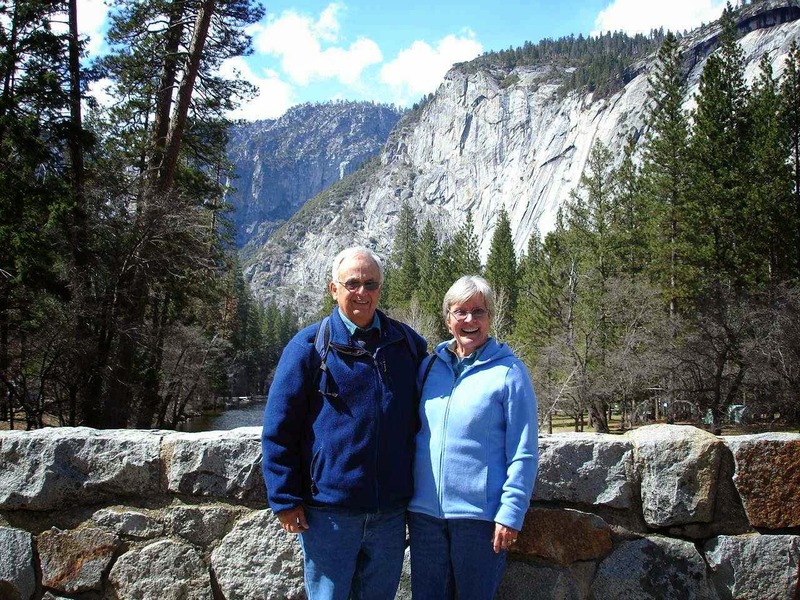 Jan and I had a wonderful visit at Park Sierra in Coursegold, California. It is one of our membership parks of Escapees and it is one of our new favorites along with Jojoba Hills in Aguanga. 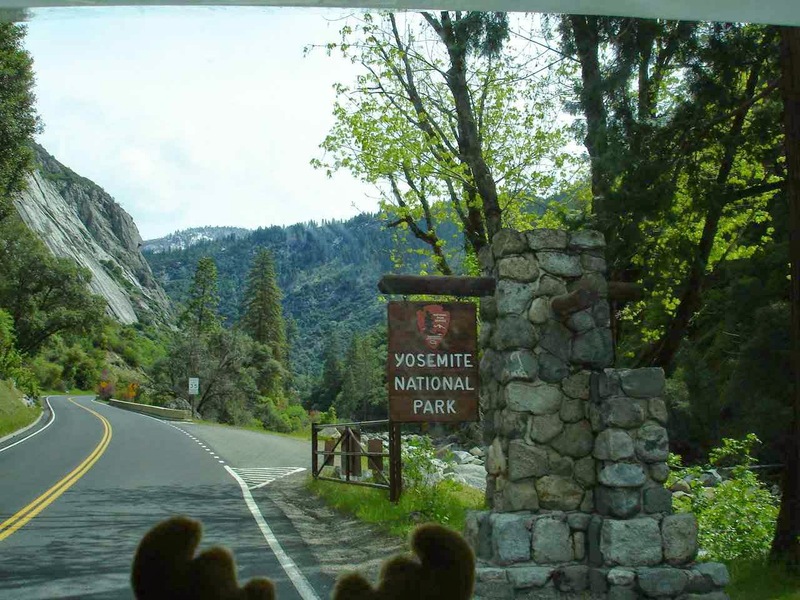 We had originally planned to visit Yosemite from Park Sierra, since it is only about 20 miles from the southern entrance to the park. 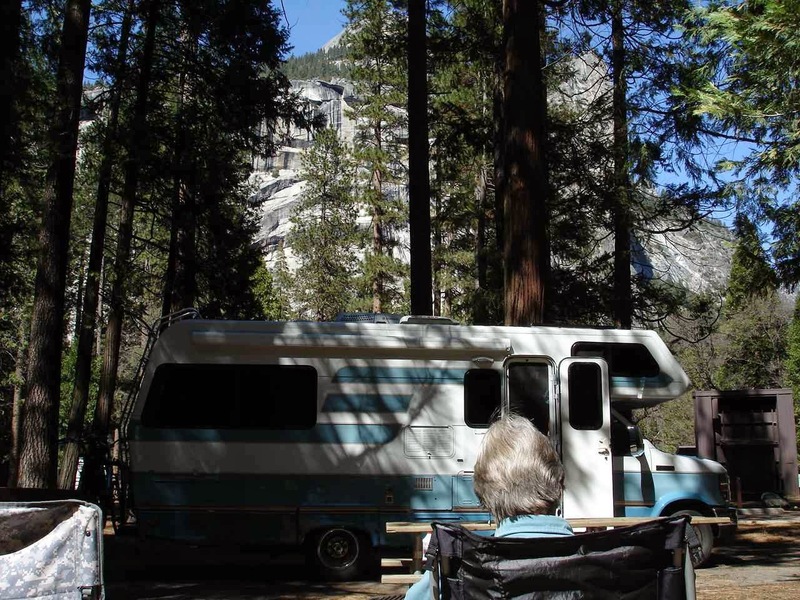 However, after talking to some of the members at Park Sierra, we decided to try to find a campsite in Yosemite. If you haven't tried this, it is not a given. 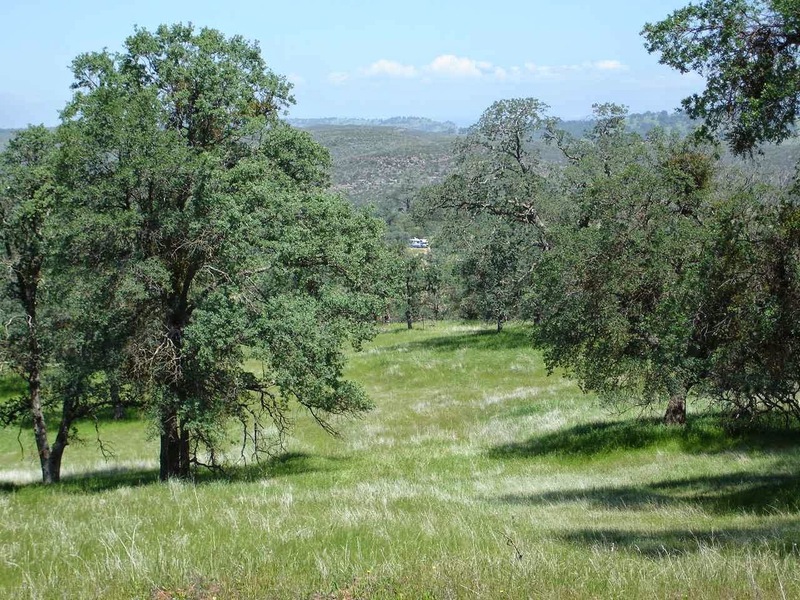 The park will tell you that all the sites have been reserved , and if you go online to the Recreation.gov site you will also see that there is no availability. But-------there had been a 15 inch snowfall in the park and we were ready to gamble. After a phone call of pressing many options on a convoluted menu, I was able to talk to a live ranger at the park. He indicated that as many as 100 campers had cancelled due to the snow(chains were required during and after the storm). So, we waited a day( for the snow to melt a bit) and headed up. Route 49 from Park Sierra to Route 140 was the recommended no snow route. 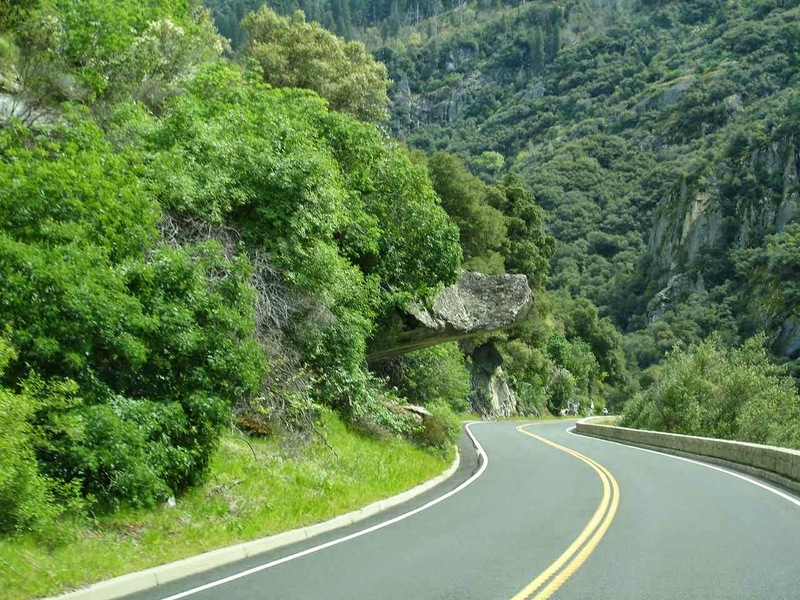 A pretty road that followed the Merced River to the Yosemite Valley. The picture above gives a hint of the wonderful spring flowers on the hillsides. Many of these were yellow and orange poppies. Eustis is worried about the one lane bridge. It is also a sign that you are starting to climb to the 4400 foot elevation of the valley. Yes, that boulder is hanging over the road!! But, we have to understand that it has been there for years. It will not fall------will it? 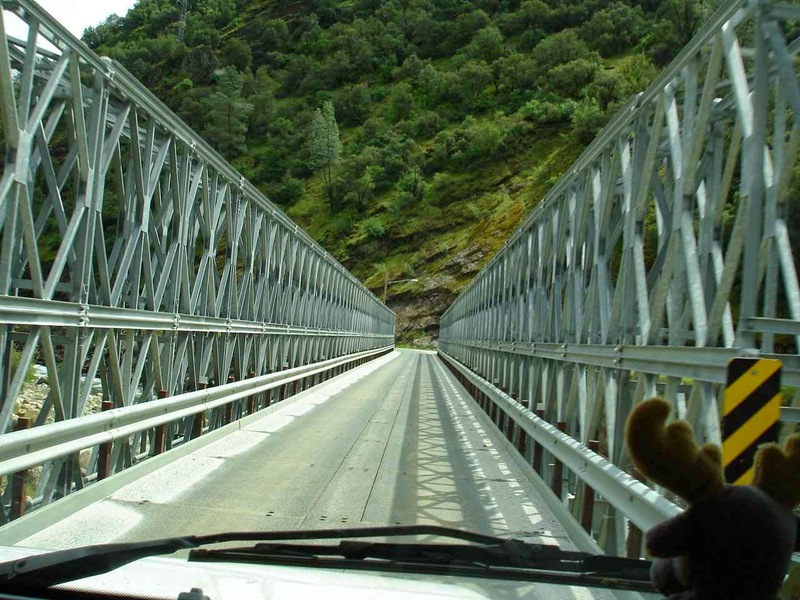 And yes, the clearance is fine for most RVs. After the entrance booth we must go through this little tunnel. Oh, that is why it is called Arch Rock Entrance. Somewhat narrow, but plenty of clearance for Lady Blue. Eustis is closing his eyes. But, once we are in the valley, the views are "wow!!" around every corner. Half Dome on the left. 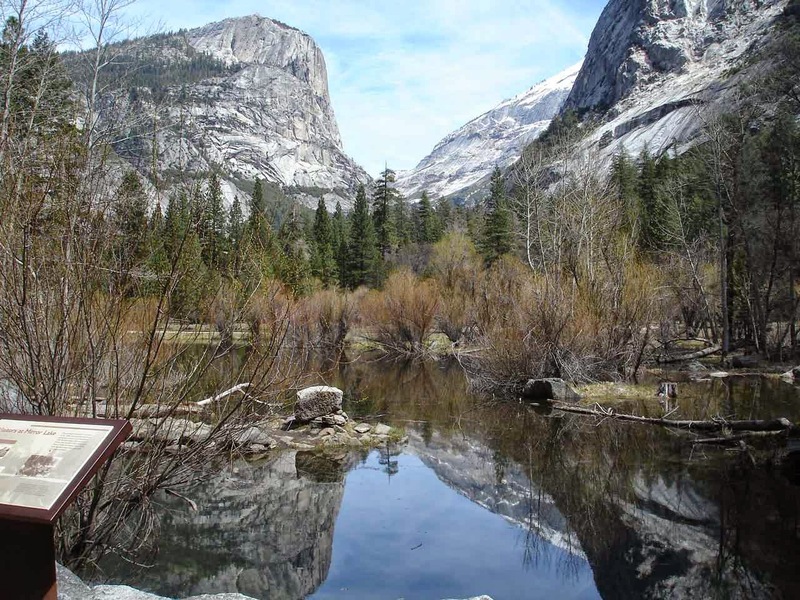 Yosemite is not completely open until the end of May, beginning of June. 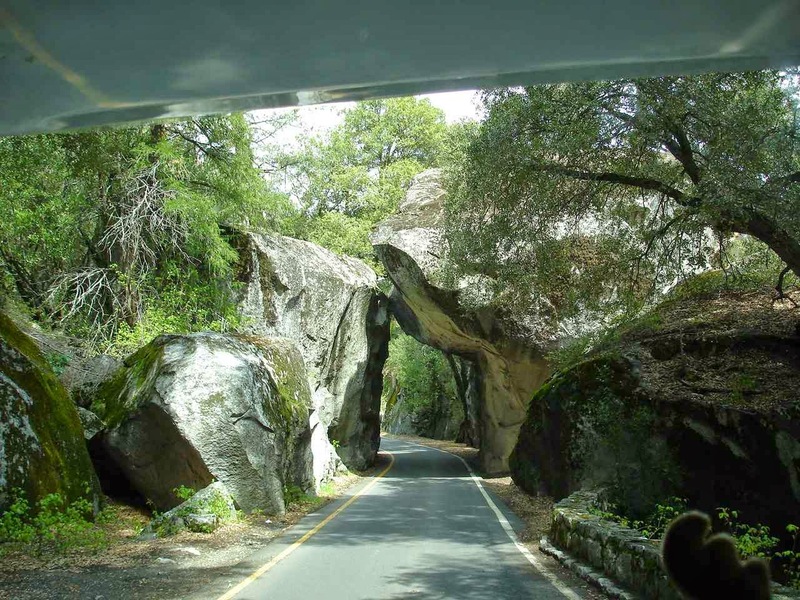 That is mostly for the higher roads going north and east of Yosemite Valley. 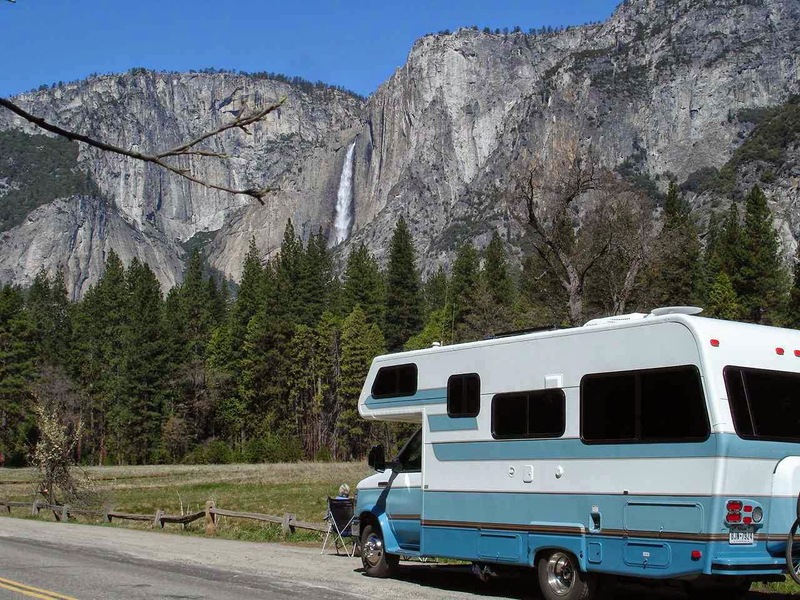 Yosemite Valley is pretty much open all year with restrictions around snow storms. 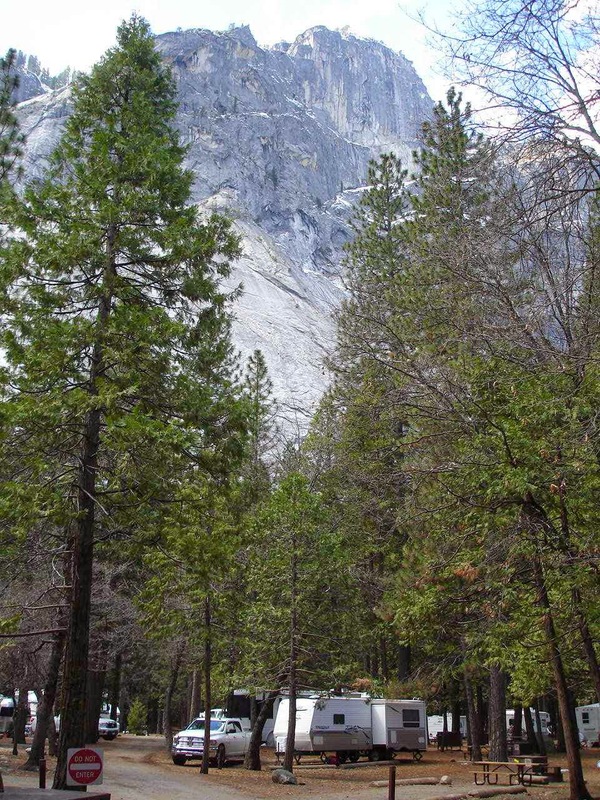 The three campgrounds in this area are Upper Pines, Lower Pines, and North Pines. We would have been happy with a site in any of the three. As you can see, the views are eye opening. We headed for the reservation office and were waited on immediately by a friendly ranger. We did have a number of possibilities for open sites. THANK YOU!!! We would have to move, but we had 2 days on one site and then 2 days on a different site. Since we are compact, that was not a problem at all. In fact, we enjoyed ourselves so much we then added 2 more days for a total of 6 nights. Remember, the online reservation site and the phone system would have told us--No Vacancy. At the entrance to our campground, on one of the bridges in the park, the two guilty parties posed for a snapshot. 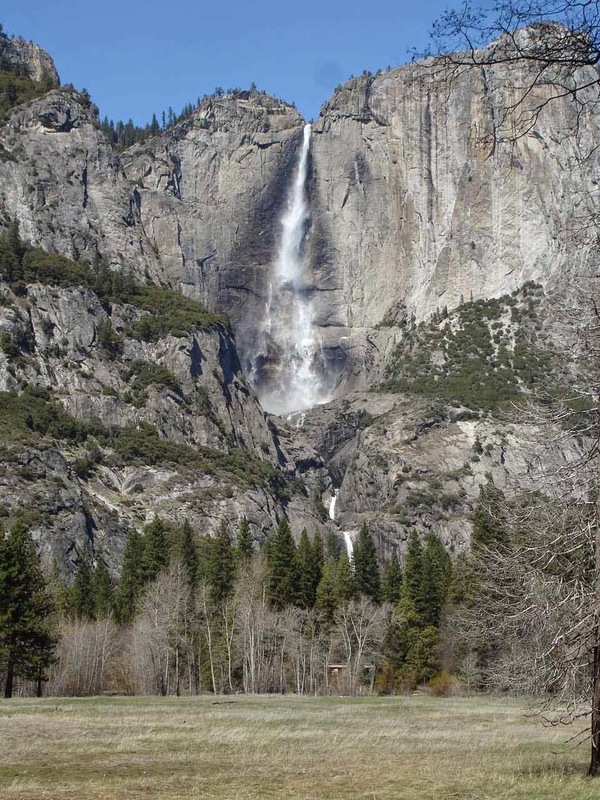 One of the most popular attractions in the park is Yosemite Falls. At 2,425 feet from the top to the base of the lower falls, it is the highest waterfall in North America and the sixth highest in the world. We are sorry, but none of our pictures can do it justice. What a joy to have six days to explore the park. We took the free shuttle all around, we walked trails and roads, and we bicycled all around. One of the things that kept coming back to us was wondering what the first visitors thought when they saw this valley. This is the Lower Falls. 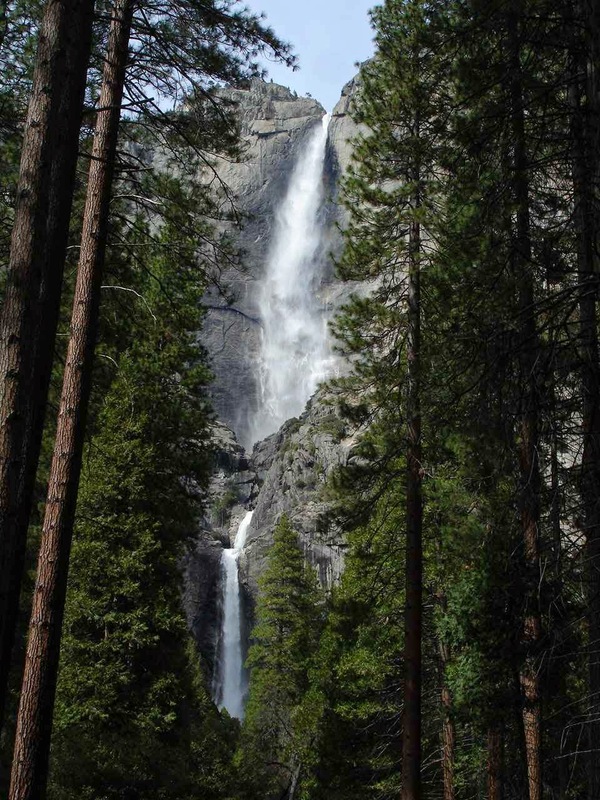 Depending on your viewpoint in the park, you might see the upper falls, or just the lower falls, or all of the upper and lower falls. We were lucky that there had been rain and snow to offer such a vivid and energetic falls. 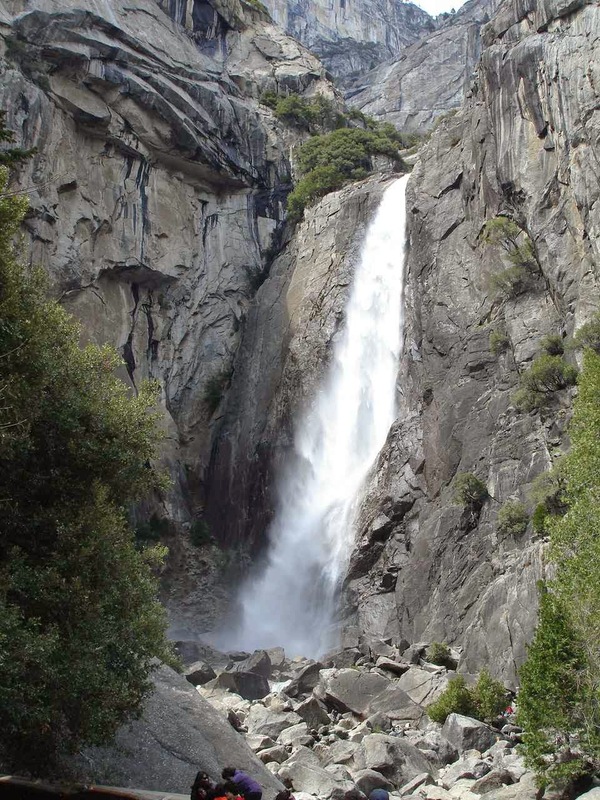 The falls do dry up in the late summer with the spring snow melt offering the best views. If you had a lot of time, you could try to speculate how many photographs are taken each day or each year. Thanks very much for digital cameras. We would have used a large number of old style roll films. Since there are so many large trees in the campgrounds, our solar panels were kept to minimal charging. But, as you can see, we ventured out in the park to a sunny spot and took out our chairs. You can see Jan enjoying the view of the falls and a little Kindle reading while we let Lady Blue recharge---doesn't take long. We didn't think of this as a negative. Do you agree? Jan and I love catching the movies at the Visitor Centers in the parks. Yosemite was one of the best. 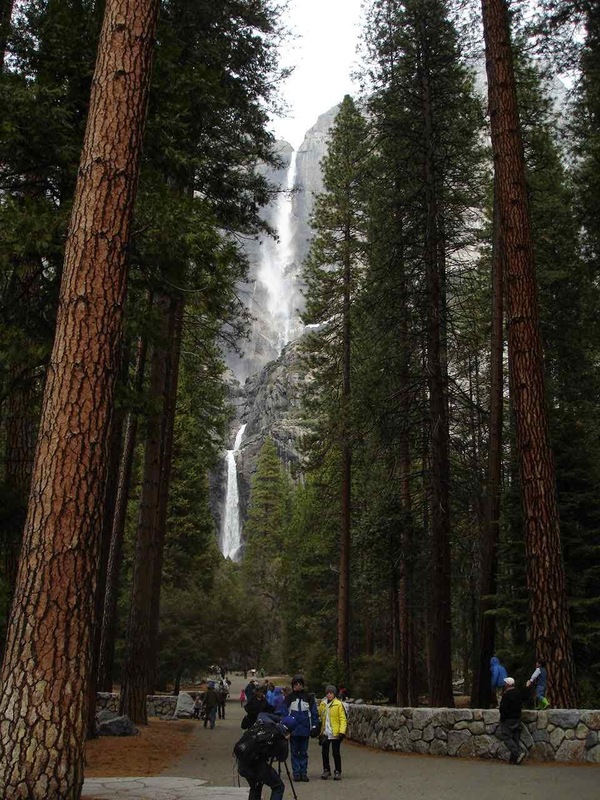 The Spirit of Yosemite was a great wide screen introduction to the park. Even better, we enjoyed a new movie by Ken Burns of PBS fame. Had we time, we would have watched it at least once more. 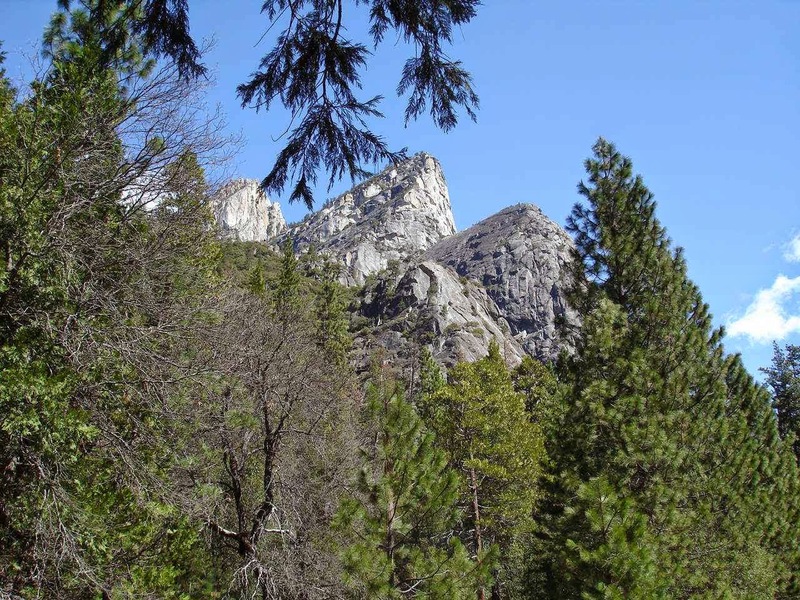 The movie was brand new and filmed for the 150th anniversary of Yosemite. From the movies and the park, we have a much greater admiration for the men and women responsible for creating our national parks. 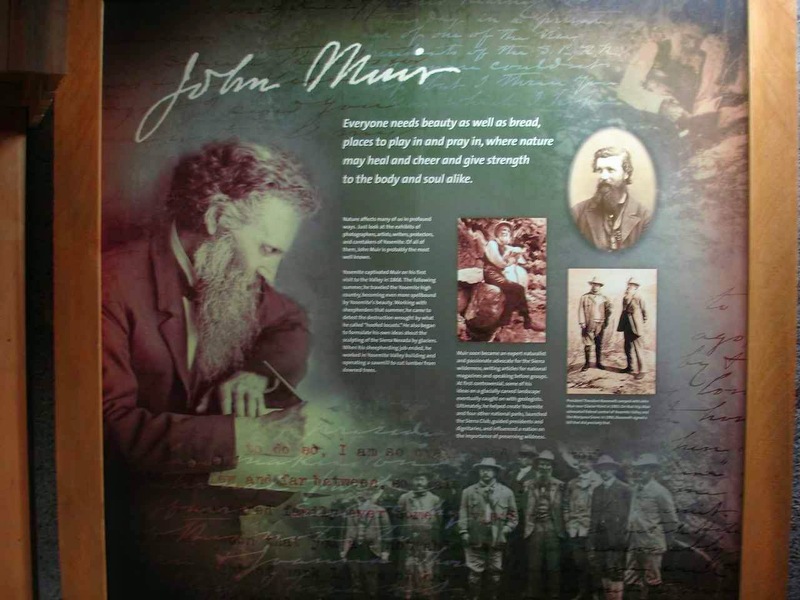 One name at the top of the list for Yosemite was John Muir. And with John Muir was the president he invited to camp with him in the valley, Theodore Roosevelt. Roosevelt loved his visit so much that he became the president most know for preserving the natural beauty of the United States. Also significant was knowing that President Abraham Lincoln signed and Congress had approved the creation of Yosemite during the worst days of the Civil War---and none of them had ever seen it!! There is more than Yosemite Falls. From the Valley Loop we had good views of El Capitan. Did not see any rock climbers, but a very intimidating climb! There are so many mountains in view on the loop. 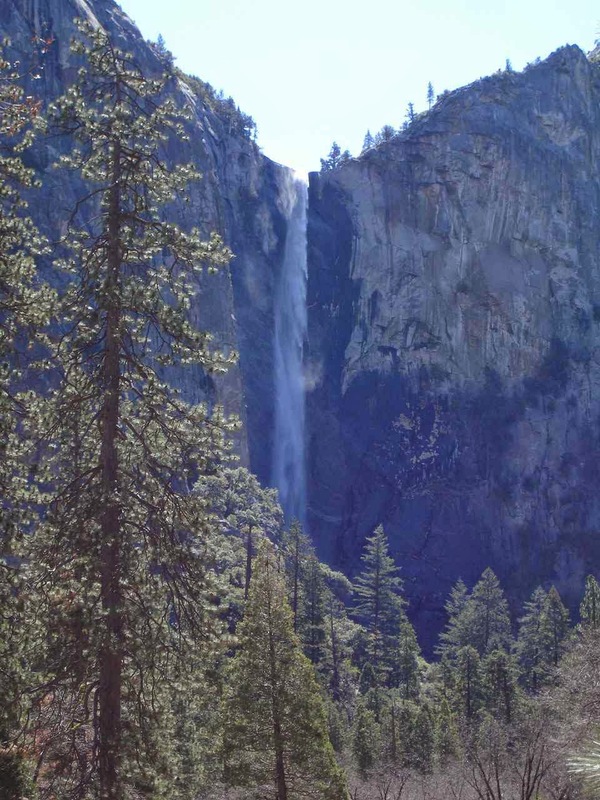 Also from the Loop Road is Bridalveil Falls. No matter what time of year, Bridalveil is always there. It's not all camping. 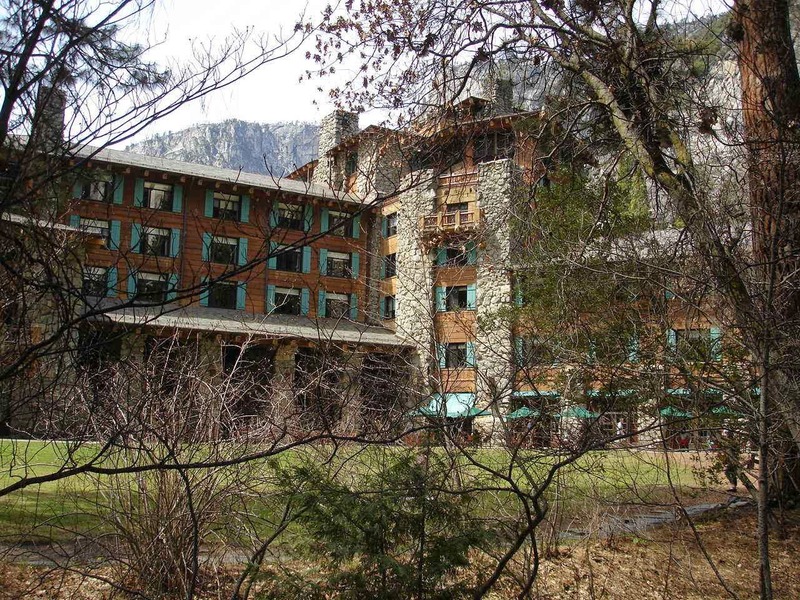 The Ahwahnee Hotel was built many years ago to attract the affluent Americans and international visitors. Kings and queens, movie stars, and other famous people have stayed in luxury at the Ahwahnee. 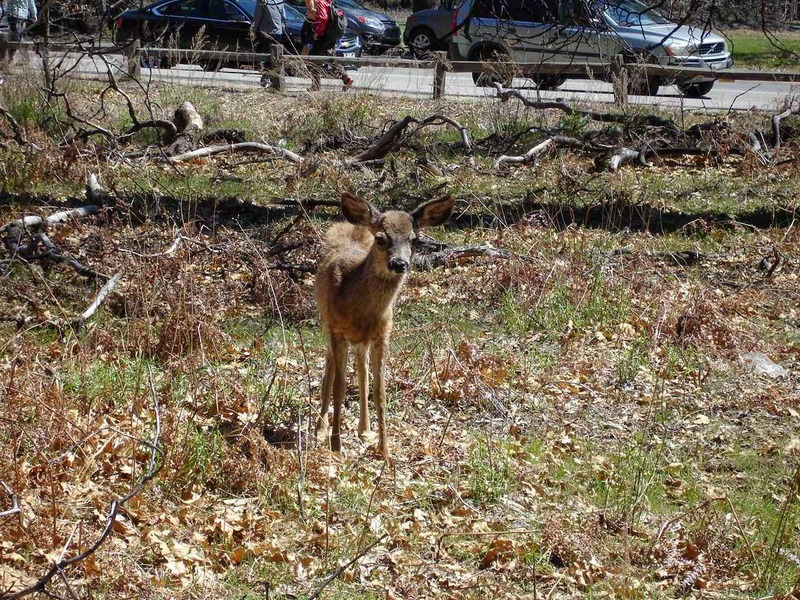 On our bike rides, there were a number of spots favored by the resident mule deer population. Again out on the Valley Loop road. there are many stops and rest areas to take pictures. It is not difficult to understand how much the early visitors loved this area. One of the buildings we enjoyed was the Ansel Adams Gallery. Many of us grew up with the black and white photographs taken by this outstanding outdoor photographer. This was perhaps his favorite subject. Jan and I loved this so much that we hiked and biked twice--once to each side. And this is called------------Mirror Lake. Can you see why that might be?? What a great spot. But---it became time to move on. We would have stayed longer. Perhaps our favorite national park. On to another Corps of Engineer park on New Hogan Lake. We loved this park as well for hiking and views of the surrounding valley and mountains. The lake is 4,400 acres---huge. Even with the drought, there is a large area of water. As you can see there about 30 trucks and trailers here for some weekend fishing. Also a good bicycling and hiking area. Our only frustration in the past weeks has been a lack of Verizon signal. We saw that we had 3 phone messages, but since we were on "extended network", we could not access the messages or tell who sent them. Right now, though, we have 4g---go figure. Can you see Lady Blue?? 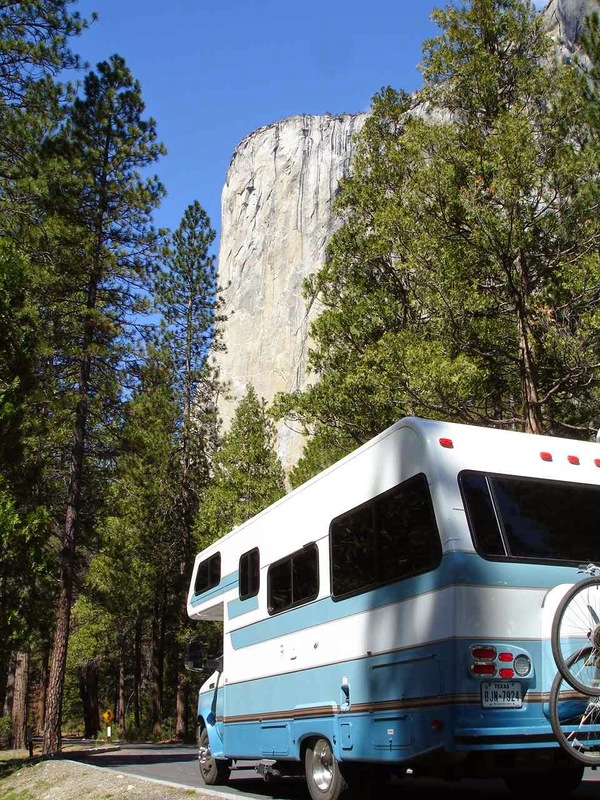 Looks like you hit the Yosemite jackpot! Great timing. 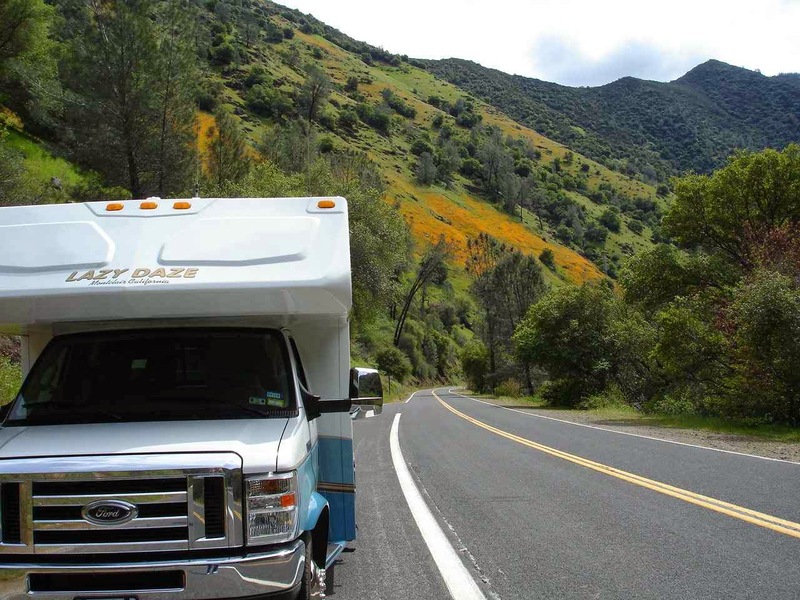 We only did a day trip to the Valley last summer but spent quite a bit of time in the eastern part of the park along Tioga Pass Rd. It's a spectacular place!